The Museum of Innocence of the Nobel Prize winner Orhan Pamuk alights at the Bagatti Valsecchi Museum with an international exhibit he brings from Istanbul to Milan, together with the celebrated love story between Kemal and Füsun, the protagonists of his novel of the same name. From January 19 to June 24, 2018, twenty-nine display cabinets will be at the historic house in via Gesù, thanks to the support of the Region of Lombardy. The very evocative images and objects recount the story of the two protagoists and bring to life the magic atmosphere of Istanbul in the 1970s and 1980s. The visit is enriched with video installations in which the voice of Orhan Pamuk, himself, recounts the sense of the extraordinary museum creation and illustrates the tie with the Bagatti Valsecchi Museum. In Milan, the display cabinets will dialogue with the warm rooms of the historic house museum, a place that Kemal loved and frequented in the novel, The Museum of Innocence, of which he is the protagonist. In this way, the exhibit creates a “museum within a museum,” giving life to a short-circuit Milan/Istanbul and reality/fiction in which the visitor walks in the footsteps of Kemal. Guiding the visitor like a golden thread is the act of collecting, in which the accent falls on objects of daily use and on their extraordinarily evocative capacity. Conceived in close collaboration with the Innocence Foundation and Orhan Pamuk, the exhibit, Love, Museums and Inspiration. 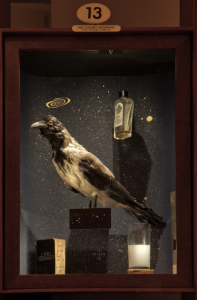 Orhan Pamuk’s Museum of Innocence in Milan was curated by Lucia Pini and Laura Lombardi. The disposition of the cabinets from Istanbul was designed by Lissoni Associates. The exhibition was born out of the collaboration between the Bagatti Valsecchi Museum and the Academy of Fine Arts of Brera, with the support of the Region of Lombardy. The didactic material and the special guided visits were entrusted to the fresh and original outlook of the students of the academy.